Background- Piece of DSP from the Festival of Prints DSP stack #126904. 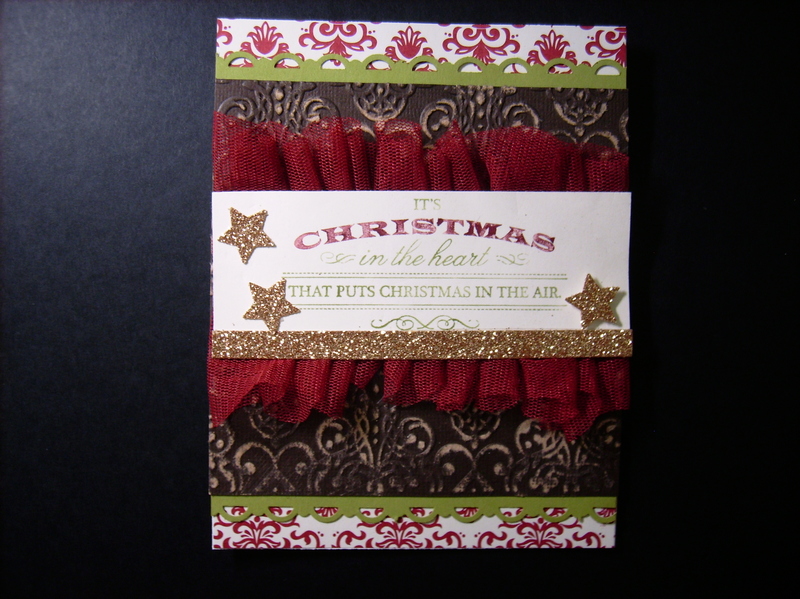 This DSP stack is a must have item and is just not for Christmas and the sheet size is perfect for quick cardmaking. Espresso Core’dinations#127848 embossed with the lacy brocade folder #127819 and sanded using the Stampin Sanding system #129367. Cherry cobble tulle #127841 is faux pleated and gathered. Heart of Christmas stamp #128129 and the champagne glimmer paper #127885. All this new stuff created a beautiful Christmas card. We love the new Core’dinations cardstock from the Stampin Up Holiday Catalog. This card is uses several of the Floral Frames Framelits #127012 cut from the the Cherry Cobbler #127846and Gumball Green#127847 Core’dinations Cardstock that was textured with the woodgrain embossing folder #127821. The First Edition DSP was cut from the Delicate Doily Sizzlits #126999 and the center of the flower is the yummy brushed bronze buttons #127833 and tied with linen thread. 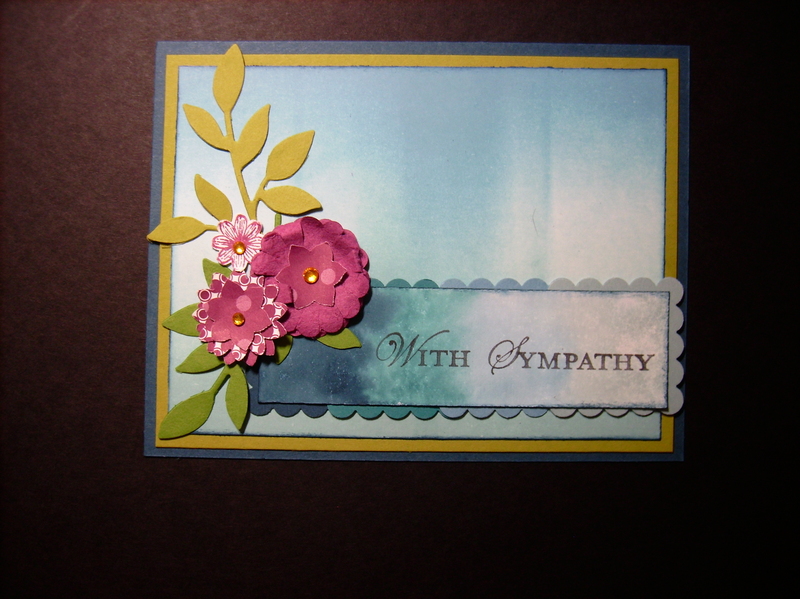 The sentiment is from the popular curly cute #120510 stamp set. Today’s card is all about inking. Cammie brayered the background using 3 shaded of blue Stampin Up inks (Marina Mist, Island Indigo and Baja Breeze) and then distressed the edges of the background with Not Quite Navy. The flowers are made from the new 1 1/4 inch scallop #127811and the Boho blossoms punch #119858 and the little leaves sizzlit #114511. The sentiment piece is made by inking the clear block H with 4 shades of blue markers in graduating colors (dark to light)Not Quite Navy, Island Indigo, Marina Mist, Baja Breeze and then filled the empty spritzer bottle #126185 with water and lightly misted the block and then stamped a whisper white piece of cardstock. Once the paper was dry she distressed the edges with Not quite Navy and stamped the sentiment. The strip was then mounted atop 4 scallop square #119884 of coordinating blue papers. I must say this is quite stunning and I cannot wait to try this technique. This is the Thank-you card that I made for our group to sign as a Thanks to Tonya Odum from Gigi’s Scrapbooking retreat in Dix IL. I was inspired by all the mason jars that Tonya used to decorate with, serve salad in and even jar smores (in baby jars) so that is how my card evolved. The background paper is from the Orchard Harvest DSP collection #126895. I then cut a mason jar on the front of the card using the cannery framelit set#127822 and then stamped the inside of the card using the coordinating I used the Perfectly Preserved stampset #126692. The jar lid was cut from a 1″ piece of ribbon and tied with then tied with a piece of linen thread. 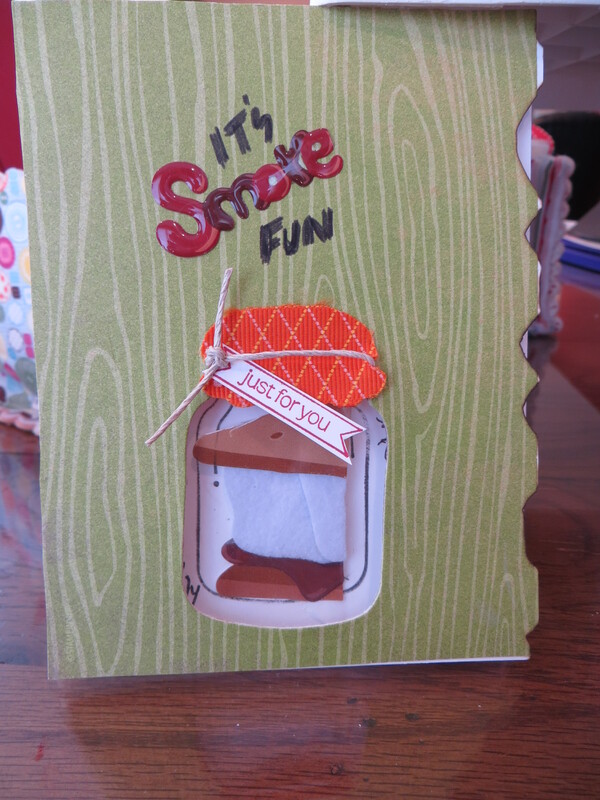 I added some smores from a pack of Jolee stickers and sealed the jar with a piece of clear plastic. The best part of this card is the burned edges. No I am not crazy, I decided to think outside the stamp with this card and make a card for the New School Year! Today my baby boy is starting his Junior Year of High School and I wanted to make a card for my dear friend Lisa who is the hardest working teacher I know. I saw this card awhile back and knew I wanted to CASE (Copy and Share Everything) it and add a few things to make it my own. 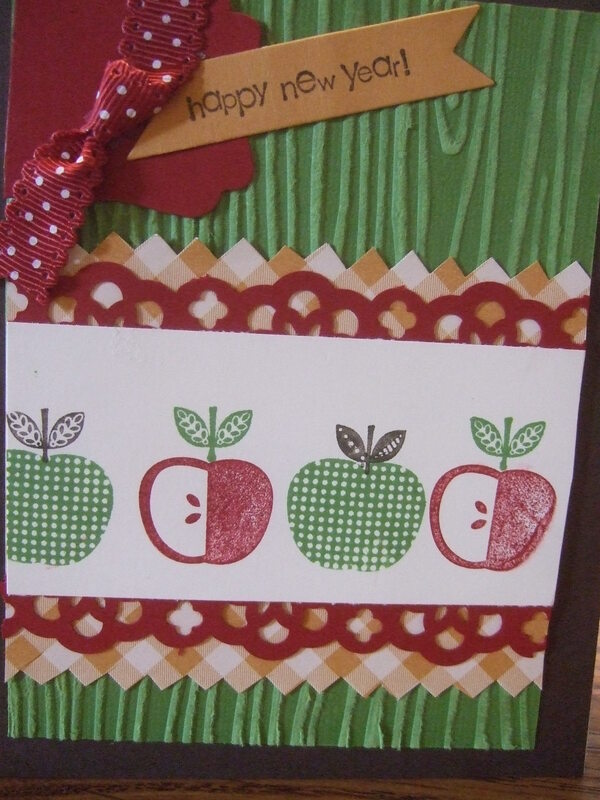 Once I finished it I thought I might as well use up the gingham DSP from the yummy Orchard Harvest DSP #126895 (Holiday Catalog) and the Perfectly Preserved Stamp set# 126692 and make cards to send to my friends and family with school age kids. I even pulled out my stamp -a -ma-jig #101049 to perfectly align the apples and the stems. The background paper was textured with the wood grain folder #127821 on the core’dinations in gumball green #127847 and the Stampin Sanding System #129368. Coming home from Gigi’s Scrapbooking Retreat after a girls weekend full of birthday fun and scrapbooking and card making. This is the card I made to house Kim’s annual Starbucks gift card that I get her and showcases the Patio Party DSP #126916 from the Stampin Up Annual Catalog. 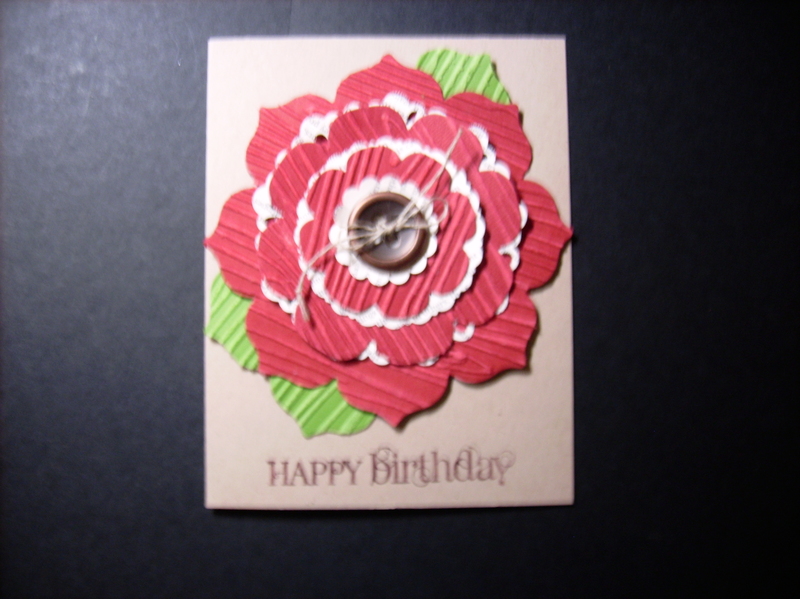 The front of the card uses 3 selections from the Patio Party DSP and Petite Pocket Bigz XL die #123131 and is velcro closed so that it safely secures the gift card. I made a ribbon bow from the In color, Primrose Petals and attached the bright little dahlia in midnight muse#127556 and added a gift tag. Well since I am at Gigi’s Scrapbooking Retreat working on Christmas cards and it is the 25th of the month and 4 months from Christmas, I thought it would be appropriate to post a super cute pop up Christmas card. 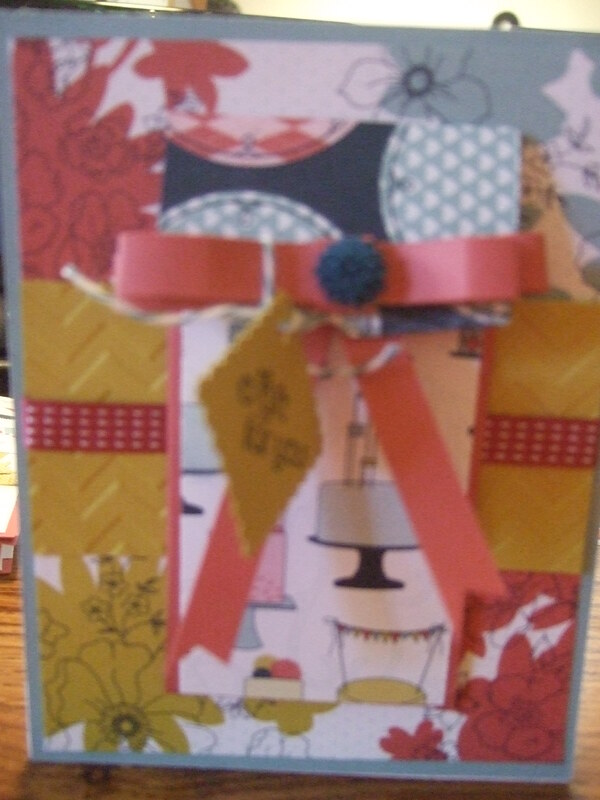 The inside is what really makes this card and was a good way to put some Be of Good Cheer DSP #126896 scraps to use. Most of my Christmas cards will be made with the Be of Good Cheer DSP because it is just that darn cute and my favorite Christmas DSP that Stampin Up has offered in a long time.